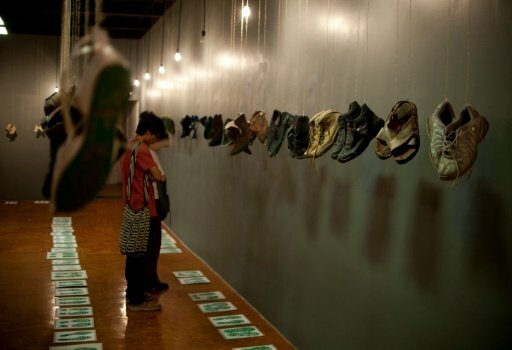 MEXICO CITY: Boots, sneakers and sandals donated by families seeking missing loved ones in a region of Latin America stricken by drug violence are dangling in a new exhibit in Mexico. Each of the 86 pairs of shoes hanging from the ceiling was donated by a family member to symbolize how far they have walked in their desperate search. The artist behind the exhibit, Alfredo Lopez Casanova, said it raises awareness of the “tragedy” of disappearances in crime-plagued Mexico and neighboring countries. More than 28,000 people are reported to have gone missing in Mexico, where drug cartels and related violence have flourished over the past decade. On Tuesday, mothers and other relatives of people who have disappeared marked Mother’s Day in Mexico by marching in the streets to demand truth and justice. The exhibition that opened Monday at the “Museum of Untamed Memory” in Mexico City also remembers victims from Argentina, Honduras, El Salvador and Guatemala. Among the shoes, each with a message about the missing victim written on the green-painted soles, are those of a nine-year-old boy. His father was among 43 college students who went missing in southern Mexico in 2014 in a case that shocked the world. Virginia Herrera, whose son was abducted by a drug gang six years ago, said the exhibition “helps make people aware” of the problem. In the northeastern state of Tamaulipas, where her son went missing, “nobody supported us,” she said. Tamaulipas, which borders Texas, has the most disappearances in the country, with at least 5,750 people reported missing. Socorro Arias had her white sports shoes hung up to symbolize her search for her son, who disappeared in 2012 while on holiday in the eastern state of Veracruz, another region plagued by cartel violence. His body was found a few days afterward but she had to wait four years for it to be identified by genetic tests. “Instead of being handled with understanding, we families are treated like criminals,” Arias said. She sees the shoes as a symbol of hope. “I continue the search, because I do not want that to happen to my other son,” she said. The organizers of the exhibition want to tour it around the country and take it eventually to the town of Tijuana on the border with California and then on to the United States.